Despite being numbered, Death Race 2 and 3 are prequels to 2008's Death Race, which was based on 1975's Death Race 2000 (produced by the great Roger Corman, who has been executive producer on the current Death Race movies). 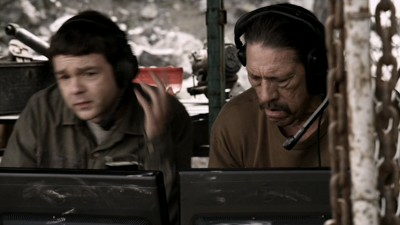 Death Race 3: Inferno picks up shortly after Death Race 2 ends. The basic premise is that prisons have been taken over by private, for-profit corporations and one way for them to make money is to hold brutal to-the-death races between inmates, which the public pays to watch on cable TV or the internet. There are few rules- cars are equipped with weapons so that racers can kill those who might otherwise beat them, and any inmate who can win five races is released from prison. Luke Goss stars as Carl Lucas, the "star" driver in these races. 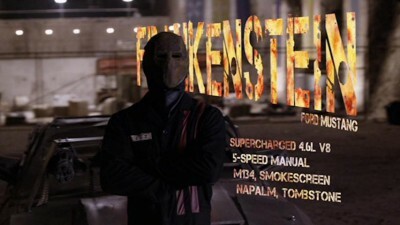 In Death Race 2 he was disfigured in an explosion during one race, and is now an anonymous driver named "Frankenstein" who wears a metal mask over his face in public. Ving Rhames is Weyland, head of the corporation that came up with the original Death Race. In this movie his company is undergoing a hostile takeover by Niles York (Dougray Scott), who plans on making changes to the races and holding them in all parts of the world. While Carl Lucas is just one more race away from winning his freedom, Niles suddenly tells him that he's changing the deal and ordered to intentionally lose the upcoming race so that he can keep racing and draw an audience. 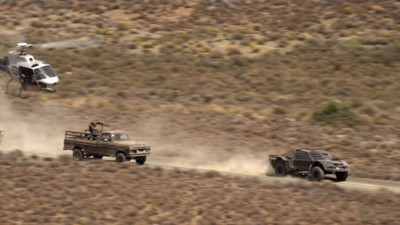 While the races in the previous movie were on the prison grounds, here they are taken into South Africa's Kalahari Desert (Death Race 2 was also shot in South Africa, but took place in a nondescript location.) Female prisoners known as "navigators" accompany the drivers in the passenger seats to advise them of what's going on so that they can concentrate on their driving, and each driver also has a "pit crew" talking to them via radio. Everyone has a tracking device injected into them which a guided missile can locate, in the event they try to escape to freedom during the race. 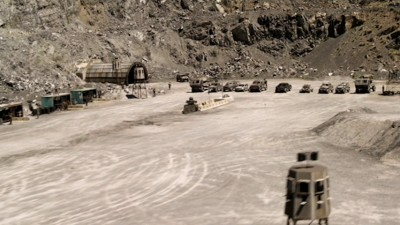 Shot digitally, Death Race 3 manages to look pristine while keeping an appropriately gritty feel. Details of the South African scenery during races are gorgeous, while action sequences take on a shaky hand-held feel with lots of quick cuts. 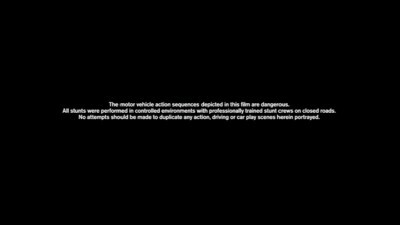 A few quick car-crash shots take on a more video-like appearance, mimicking the live internet coverage (details about these are covered in the director's commentary track). Color level throughout is rather light. Being a direct-to-video movie, the aspect ratio is 1.78 but curiously the deleted scenes on the disc are presented in 2.35. It seems that this may have been composed with 2.35 in mind but looks fine as it is (similar to Super 35, there is no picture information cropped out here). The included standard DVD looks softer and more compressed than the Blu-Ray, of course. The Blu-Ray's audio is in 5.1 DTS-HD Master Audio and sounds fantastic. This is a very active sound mix with liberal surround and LFE use which should definitely be played loud! There are of course plenty of loud engine sound effects, explosions and an exciting music score that ranges from heavy guitar to techno to a traditional African sound. Dialogue is mostly clear even amongst the accompanying loudness. The standard DVD's 5.1 Dolby Digital track also sounds very good, but sound quality is noticeably below that of the Blu-Ray. French and Spanish dubs in 5.1 (DTS on the Blu-Ray and Dolby Digital on the DVD) are also included, as well as English SDH, Spanish and French subtitles which are also included on the movie's extras. The Blu-Ray also includes D-Box motion code, which with the proper equipment will shake your seats as the movie is playing. I have never seen this in action, but would love to have it if it weren't so expensive (it would cost me at least $10,000 to add it)! Many Blu-Ray titles have included this so far, hopefully it will become more practical to be equipped for it in the future. A commentary track with director Roel Rene is included on both discs during both cuts of the movie. (He appears to be commenting on the unrated version, with the commentary on the rated version having been slightly edited so that words are not skipped over.) He speaks very passionately and provides a lot of interesting information about the movie. Most of the cars used here were previously used in Fast Five and re-purposed, which saved a lot of money on the production. He also details much of the camera equipment that was used, commenting that some of the smaller cameras were destroyed after shooting crashes and explosions but they were so relatively inexpensive that it was worth the loss in order to get the shots. He comments that while he likes shooting on conventional film, "those days are over" for lower-budget movies, and remarks on how digital technology made many scenes easier and more cost-effective to shoot. Both the Blu-Ray and DVD include a 10-minute making-of piece (in hi-def widescreen at 30 frames per second with 2-channel sound) with the usual cast and crew interviews and production footage. There are also nine brief deleted scenes as well as a "Deleted Shots Montage" which shows a number of unused shots and production footage set to music from the film. Only on the Blu-Ray disc, there is an alternate opening which introduces things a bit slower and includes main credits at the beginning rather than the end. There are also two more featurettes: "Racing For Death" which describes the design of the cars used in the movie and a profile on actor Danny Trejo titled "Art Imitating Life: Goldberg" which is rather interesting. I've enjoyed his often comedic work in other movies for a while and this touches on his past as having been in prison decades ago and finding new meaning to his life as an actor. The Blu-Ray includes no trailers but if your player is BD-Live equipped and connected it will play about three from that source when the disc is loaded, and there is also a BD-Live portal where you can access many more trailers and promos for Universal Studios attractions. Technical quality of these was of course not as good as they would have been on disc, but at least they played fine for me with no dropping out as I've seen on other studios' BD-Live areas. The DVD opens with promos (all in widescreen and 2-channel sound) for Dead in Tombstone (also directed by Roel Reine), Guns, Girls & Gambling, Silent Hill: Revelation, Transformers: The Ride at Universal Studios, Season One of "Grimm", End of Watch and Hit & Run. Additionally from the menu there are trailers for the first two Death Race movies, Fast Five, Smokin' Aces, Wanted, The Chronicles of Riddick, Doomsday and The Bourne Ultimatum. Oddly, Universal is making this movie available online before the disc hits retail. It has already been available for purchase on Vudu and Amazon VOD for several weeks (but not for rent until the disc is released), and has now been made available on Netflix streaming one week before the disc's street date. (Netflix lists it as the unrated version but I have verified it is actually the rated version- while it is offered in high-quality video with 5.1 sound, it still can't touch the Blu-Ray.) An Ultraviolet code is included with the discs which will also let you access the movie on Vudu and Cinemanow at no additional cost if you so desire. Death Race 3: Inferno is far above average for a direct-to-video movie, with a great-looking picture and room-shaking sound mix. I applaud Universal also for continuing to include both cuts of the movie together rather than on separately-released discs as they had in the past. This movie probably won't win any awards, but it's great mindless fun. While available through "digital" means, I urge those with good home theater systems to experience it on Blu-Ray disc, as nothing else comes close to its quality. Pictures in this review were taken from the included standard DVD.